Karimunjawa National Park, which forms a chain of 27 islands, represents several ecosystem types including lowland rain forest, seagrass and algae fields, coastal forests, mangrove forests, and coral reefs. A characteristic plant of the Park is dewodaru (Crystocalyx macrophyla) which grows in lowland rain forest. The plants growing in the seagrass and algae fields can be classified into three divisions, namely Chlorophyta, Phaeophyta and Rhodophyta. The coastal and mangrove forests are characterized by ketapang (Terminalia cattapa), cemara laut (Casuarina equisetifolia), jati pasir (Scaerota frustescens), setigi (Strebus asper), waru laut (Hibiscus tiliaceus), and mangrove (Rhizophora mucronata).Karimunjawa National Park's coral reefs are made up of fringing reefs, barrier reefs and several patch reefs. They have an incredible wealth of species: 51 genera with more than 90 species of coral biota and 242 species of ornamental fish. Two protected biota species, black coral (Antiphates sp.) and organ pipe coral (Tubipora musica), can be found here. Other protected sea biota include the hornet helmet (Cassis cornuta), triton trumpet (Charonia tritonis), pearly-chambered nautili (Nautilus pompillius), green shell (Turbo marmoratus), and six species of clam. The diversity of terrestrial animals of this Park is not as high in terms of numbers as that of the aquatic animals. However, it is still possible to see deer (Cervus timorensis subspec), pangolin (Manis javanica), 40 different bird species such as the green imperial pigeon (Ducula aenea), white-bellied sea eagle (Haliaeetus leucogaster), yellow-vented bulbul (Pycnonotus goiavier), red-breasted parakeet (Psittacula alexandri), etc., as well as hawksbill turtle (Eretmochelys imbricata), common green turtle (Chelonia mydas), and edhor snake. The white-bellied sea eagle is listed as an endangered species. Around Kemujan island, the wreck of the Panamanian ship "Indono", which sank to the sea bed in 1955, is now a habitat of coral fish and is a popular site for wreck diving. Only five of the 27 islands are inhabited: Karimunjawa, Kemujan, Karang, Nyamuk and Genting. Karimunjawa Island is the centre of this sub-district, which is located 83 km from Jepara (a city famous in Indonesia for its woodcarving industry ). 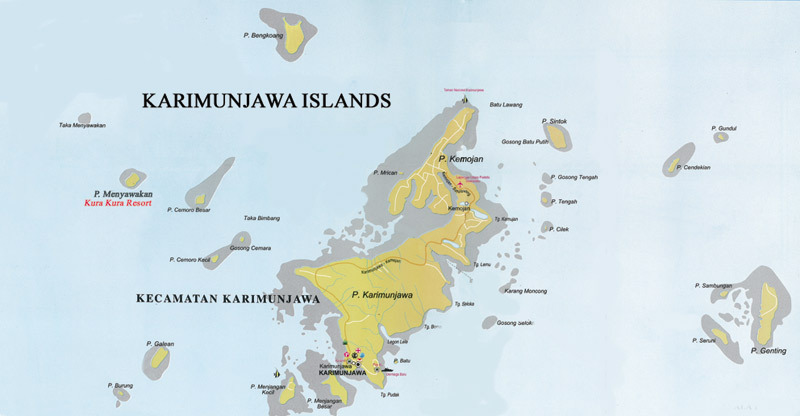 The name "Karimunjawa" comes from the era of Sunan Muria. He was one of the outstanding religious figures who helped to disseminate Islam in Java. Story has it that once upon a time, Sunan Muria was viewing the islands of Karimunjawa from Java, but they were just a blur on the horizon - in the Javanese language, 'kremun-kremun soko jowo'. When Sunan Muria's son, Sunan Nyamplungan, or Amir Hasan, passed away, he left a bequest of lele fish (Clarias meladerma) without poisonous fins, the grave of Nyamplungan, dewodaru wood, sentigi, kalimosodo and edhor snakes, all of which are now considered sacred by the local people. Menjangan Kecil, Menjangan Besar, Tanjung Gelam, Legon Lele, Genting, Kembar, Parang, Cemara and Krakal Islands: marine tourism (sailing, surfing, water skiing, swimming, sunbathing on white sand beaches, diving/snorkelling), camping, cultural visits, deer and bird observation. Bengkoang and Kemujan Islands: camping and wreck diving. Bukit Bendera, Bukit Gajah and Legon Goprak: tracking and marine tours. Travel bureaus in Semarang and Jepara offer package tours lasting from between one and seven days. Cultural attractions outside the Park include the Durian and Lomban Festivals in Jepara, held in January and March each year. Best time of year to visit: April to October. How to reach the Park: Semarang-Jepara, about 1.5 hour by car (100 km), then Jepara (Kartini Harbour)-Karimunjawa, about 5 hours by ferry (twice a week), or Semarang (Achmad Yani Airport)-Kemujan Island by plane (once a week).